IntroducingNew-in-Box Indigi Heavy Duty 12000mAh Multi-Function Portable Mobile PowerBank Emergency Vehicle Jump Starter / Personal Power Supply for iPhoneSmartphone Laptop Camera / Built-in LED Flash Light SOS light. This Jump Starter and Power Bank Kit with a 12000mAh Power Bankthat can be used to restart your car in case it dies, as long as it has more than 20 percent battery. Perfect for people who have car emergency and want extra functionality. With true powerful LED flashlight, three-function switchover. It is the ideal choice for long driving, camping, hiking, biking, traveling, night shift workers, emergency power back up at home and in your vehicle. Battery indicator prominently displays the amount of battery the device has left, reminding you to recharge. Automatic shutdown under no-load and over-load conditions. This car jump starter power bank is compact and portable. 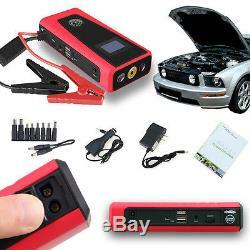 It can jump start your car 3000 times if fully charged, over the complete life of the battery. 5-in-1 car jump starter power bank: auto 12V emergency starter, car battery charger, microUSB and Lightning Cable included, 7-in-1 laptop charger and LED emergencylight. Built-in 12000mAh power bank with 12V DC output, it features a key switch to choose between different voltages, an LED indicator showing the battery status, 7-in-1 laptop adapters fitting for various brands of laptops. The LED emergency light has 3 modes (high, strobe and SOS) and can last 120 hours. 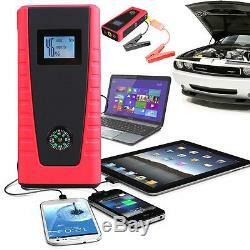 Smallest, lightest, and most powerful portable 12 Volt jump starter- power bank. Built-in 12000mAh power bank with 12V DC output, it featuresa key switch to choose different voltages. 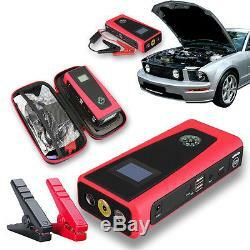 Support 12V vehicle jump starter and charge for various cellphones, PSP, MP3/MP4, PDA, Laptops GPS, camera Etc. Approx 20 times starting a vehicle when fully charged. Battery can be charged at home using a wall charger or insidethe vehicle using the car charger. Power charge of this device will remain 36 months withoutrecharging (standby). Safe, reliable, and perfect for everyday driving, traveling, outdooractivities, emergency home use. This device is a must inevery vehicle, home, and or even for personal carry on. TheLED emergency light has 3 modes (Flash, strobe and SOS). Battery capacity : High capacity12000 mAh. Output Current: For powersupply to 12V. Laptop Interface Adapters : Male 6.0 x 4.4mm /6.3 x 3.0/5.5 x 2.5mm/5.5 x 1.7mm For ACER/Male5.0mm With Pin 4.8 x 1.7mm For HP/7.4 x 5.0mm /Male 7.9mmWith Pin. Power Source : Built-in Batteryor Power Adapter. Battery Type : High Quality Li-Polymer. Complete charging Time : 3-5Hours(15V 1A charging). Built-in 12000 mAh high capacity rechargeable Li-poly battery. Life Cycle : > 3000 times. USB power output :5V 2A. Built-in 3W LED emergencylight with 3 light modes. Package Contents : 1x 12000mAh jump starter power bank, 1x MicroUSB, 1x Lightning Cable, 1x 7 in 1 notebook/laptop connectors, 1x power adapter, 1x jumper cable with 2 battery clamps, 1x carrying bag, 1x user manual, 1x car charger. The item "NEW Heavy Duty Portable Power Bank & Emergency Car Jump Starter Battery Booster" is in sale since Sunday, May 24, 2015. This item is in the category "Cell Phones & Accessories\Cell Phone Accessories\Chargers & Cradles". The seller is "indigi" and is located in Millbrae, California. This item can be shipped to United States, Canada.